I hope you are all well and that you recovered from the St. Patrick’s Day celebrations! We have finally seen a break in the cold spell and are looking forward to warmer weather. This is our first quarterly newsletter. We have lots of exciting activities lined up for you including a trip to Winterthur, where 40 costumes from the television series “The Crown” will be on display. If you are interested in participating please confirm before the end of April as places are limited. We also have a lot of musicians lined up this quarter. Other exciting new programs happening at the Irish Immigration Center include our first evening Genealogy group presented by DNA guru Lori Lander Murphy. This will take place on the last Thursday of every month from 7:00 p.m. until 9:00 p.m. All are welcome. We are also starting a walking club twice a week in April. Check our Facebook page for details or give me a call on 610-789-6355. Wednesday, April 3 at 1:00 p.m.
Join our legendary bingo caller Chickie Harvey and friends for a game of Bingo after the weekly lunch at the Irish Immigration Center. All are welcome. Monday, April 8 from 12:00 p.m. – 3:00p.m. The Irish Center will host their annual Easter Celebration at the Commodore Barry Club. All are welcome to join for some delicious food, and Easter fun. Please RSVP by calling 610-789-6355 by Thursday April 4. Tickets cost $5. Transport will be provided from the Immigration Center at 11 a.m., so let us know if you need a lift! Thursday, April 25, May 30 and June 27 from 7:00 p.m. - 9:00 p.m.
Join Lori Lander Murphy and friends to discover your ancestors in Ireland and America and to learn about their lives and experiences. All are welcome. All you need is curiosity! Tuesday, April 9, May 14 and June 11 from 11:00 a.m. - 1:00 p.m.
Join this group to discover your ancestors in Ireland and America and to learn about their lives and experiences. All are welcome. All you need is curiosity! Wednesday, April 10 at 12:30 p.m. The wonderful Sean Durning will be strumming a few tunes after the weekly lunch at the Irish Immigration Center. All are welcome. Wednesday, April 17 at 12:00 p.m.
We are hosting our Easter special weekly lunch in McGillicuddy’s on Wednesday, April 17 with the talented Terry Kane providing the music. Please RSVP by Monday, April 15 by calling 610-789-6355. Please bring a dessert to share. Hope you to see you all there! Wednesday, April 24 at 12:30 p.m.
Join Health and Nutrition Specialist, Anthony O’Gara for a talk on how to get in shape for the summer after the weekly lunch. All are welcome to join. Wednesday, May 8 at 12:30 p.m.
Join Professor Watson as he gives us a fascinating insight into his findings and the history behind the Duffy’s Cut tragedy. All are welcome. Monday, May 13 from 12:00 p.m. – 3:00 p.m.
All are welcome to join us for some delicious food. Please RSVP by calling 610-789-6355 by Thursday May 9. Tickets cost $5. Transport will be provided from the Immigration Center at 11 a.m., so let us know if you need a lift! Wednesday, May 15 at 12:00 p.m.
We are hosting our weekly lunch in McGillicuddy’s on Wednesday, May 15 with the Vince Gallagher providing the entertainment. Please RSVP by Monday, May 13 by calling 610-789-6355. Please bring a dessert to share. Hope you to see you all there! In May, we are going to the stunning Winterthur House and Gardens to view a fantastic collection of costumes from the TV series “The Crown. Included is the house tour, the garden tram ride, entrance to the special exhibitions and a hot lunch of your choice. If you want to carpool from the Irish Immigration Center, the ticket price is $35.For those that want to avail of our transportation option the cost is $55. You must RSVP by April 25 by contacting Nicola on 610-789-6355 or nicola@icphila.org. Wednesday, May 22 at 12:00 p.m.
We have a number of talented chefs in our group and are always excited to see what delicious treats each potluck uncovers. Bring in a dish containing your favourite spring foods to share with the group. Wednesday, June 5 at 1:00 p.m.
Join us for our weekly lunch followed by a showing of famous comedy “In Bruges” starring Colin Farrell and Brendan Glesson about two Irish hitman hiding out after a job goes wrong. Join us to celebrate the Rosenbach’s annual Bloomsday, where we celebrate Leopold Bloom’s journey through the streets of Dublin in Jame Joyce’s masterpiece Ulysses. The day includes musical performances, readings from Ulysses and a beer garden. Admission is free and we will have a stand at the event. Be sure to drop by and say hello. Wednesday, June 19 at 12:00 p.m.
We are hosting our weekly lunch in McGillicuddy’s on Wednesday, June 19 with a mystery musician. Please RSVP by Monday, June 17 by calling 610-789-6355. Please bring a dessert to share. Hope you to see you all there! Wednesday, June 26 at 1:30 p.m.
All are welcome to join us for the battle of the brains in the return of the Quizmaster of the Universe. As always, this will be a lot of fun. Youth Mental Health First Aid is primarily designed for adults who regularly interact with young people. The course introduces common mental health challenges for youth, reviews typical adolescent development, and teaches a 5-step action plan for how to help young people in both crisis and non-crisis situations. Topics covered include anxiety, depression, substance use, disorders in which psychosis may occur, disruptive behavior disorders (including AD/HD), and eating disorders. Places are limited, so please enroll as soon as possible to ensure your place. 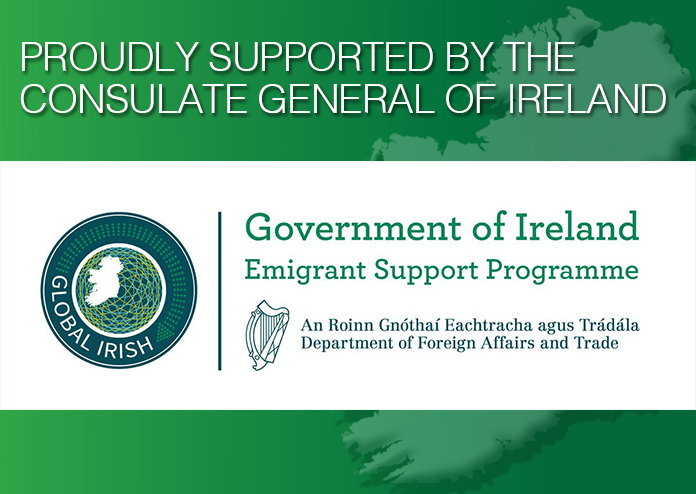 You can enroll by calling the Irish Immigration Center, Ph. 610.789.6355.